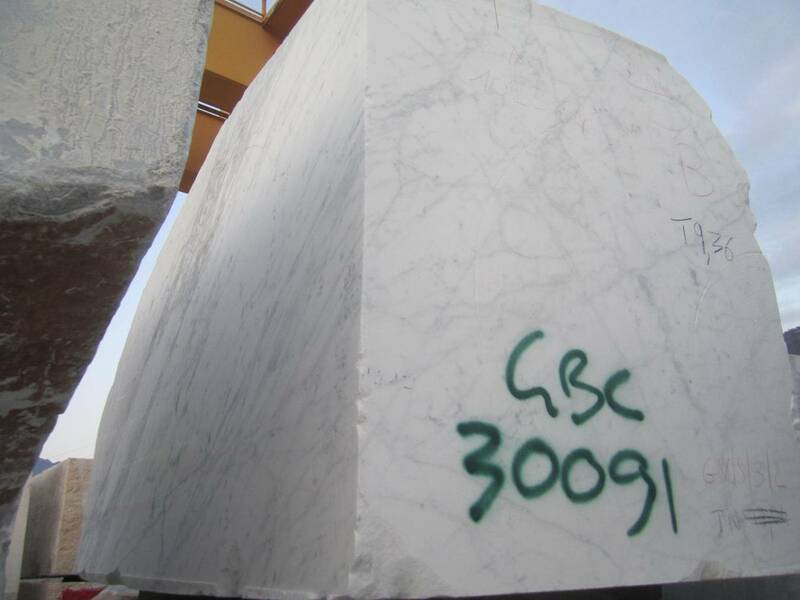 Carrara Bianco Marble – Block Selection and Rejection. 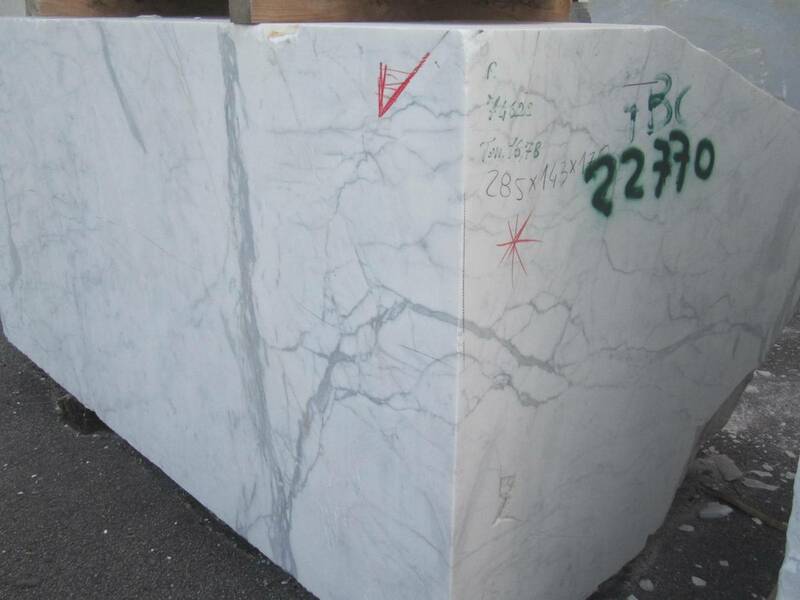 Some of the most perfect Carrara blocks we have seen in some years. #25596 is perfect in every way. The veining stands out against the white base of the block. 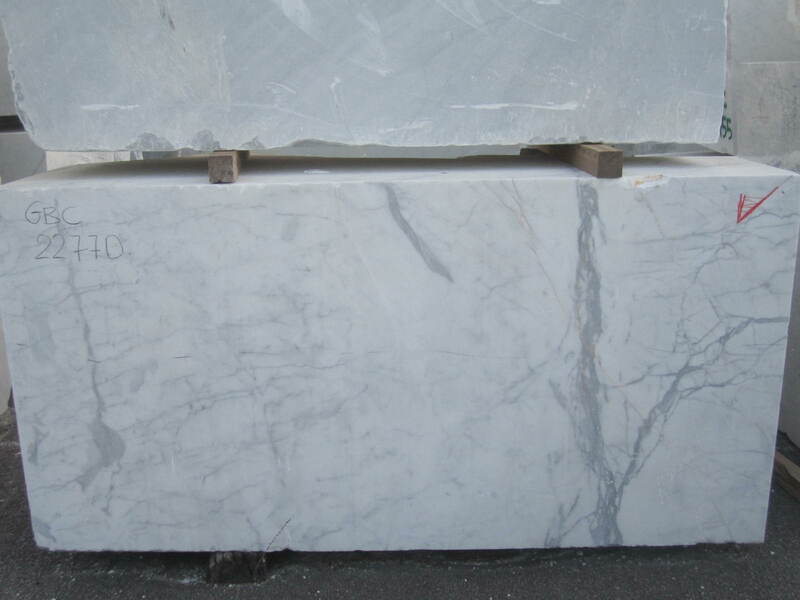 The veining in Carrara is quite consistent in color it has always been the constant when viewing the quality. It is the base color that varies at thebuilderdepot.com we look for a white base and gray veining. The block with the red check we have chosen. The block resting on top is rejected. Without seeing any veining in the block you can tell it is too gray. So gray that the veining has simply merged with the stone itself. Some blocks meet our expectations then others like these exceed them. 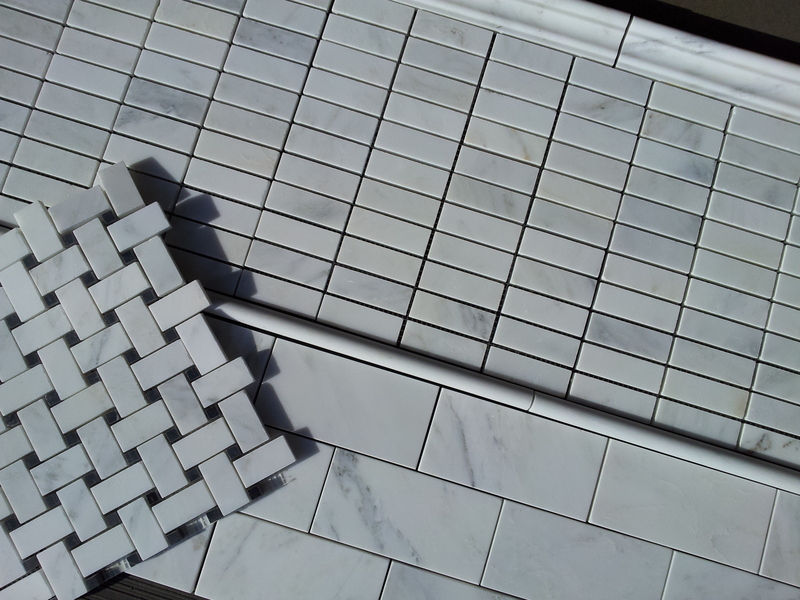 This will create the most perfect looking Carrara tile. 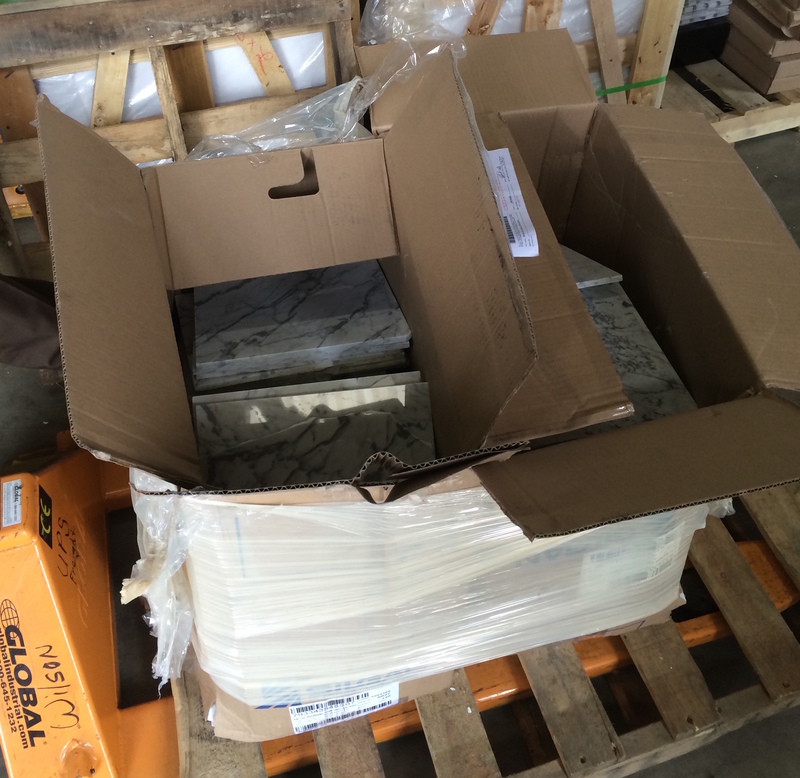 If it is a white base and gray veining you seek – these blocks will yield the best we have seen in years. This selection of blocks is whiter Carrara than is normal. Carrara Bianco blocks in Italy. These blocks moved by overhead cranes can weight over 10,000Lbs. These blocks are then transported to the factory to be cut into field tile, mosaics and trims, packaged and then placed into wooden crates each weighing 2,000Lbs. It is no light task. These blocks are from the same quarry and from the same section of the quarry, but even still there is variation between the blocks. One of our jobs is to get the match as close as possible. This selection of blocks from Italy is probably the whitest we have seen in years. It will take until May until this has been processed and ready for shipment, then another month for it to arrive in our warehouse. We sell the 3×6″ for just $7.50SF which is incredible considering the time, journey and people involved in the process to get this to the USA. Then shipped back out again in the quantity our customers require for installation. The whole process from finding the section in the quarry to arrival in mosaic, tile and trim format at your home is 12 months (minimum). Of course this is short in comparison to the millennium or so that it took to create the rock itself. (Gives me an idea for another blog “how is marble created”). Having explained the time frame, once the product is in stock in our warehouse we can ship out in 1-2 days. Most customers receive their order within 3 days of shipping. We try and keep stock of all products, but we do not fill our inventory with inferior product. If we have ran out of stock of an item it is not because we cannot get more Carrara it is because we cannot get more good Carrara quick enough. We reject 70% of the blocks this slows down production. But we have standards and we will not compromise them just for a sale. Alpharetta (GA) Picture taken on a sunny day at the warehouse. Just received in 4 pallets of Basketweave, 6 Pallets 3×6″ Subway Tile and 4 pallets of 1×3″ Stacked Brick mosaic – the product was such an incredible match that we could not resist taking a picture. This pic was taken with a cell phone camera the Samsung android phone, so nothing technical and it even looks good with a cell phone camera. So you can imagine how good it looks in real life. 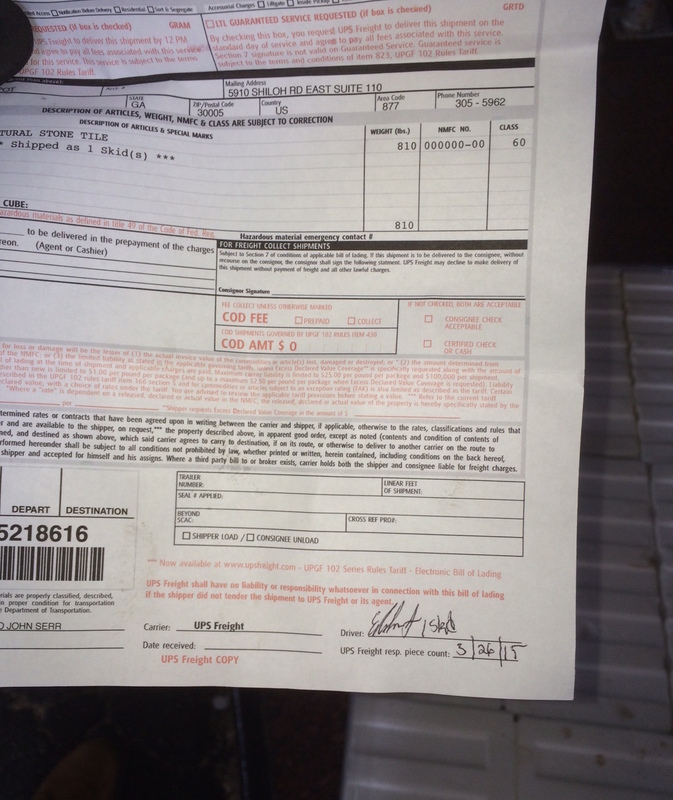 When making a Return Freight – Document! This product was wrapped (but should have been better secured, you can see it is not attached to the pallet, if I was the driver I would not have signed for this and asked for it to be attached to the pallet) and the driver signed for it. The driver signed for it. If the driver was not happy with how it was packed he should have asked for more shrink wrap to be put on, or not picked it up. But he signed for it. Stating it was good and could be shipped. What we got back. Absolutely destroyed. UPS dropped it, did not call and tell us, threw it in boxes and now it is a claim. But because the customer documented with pictures the claim was easy. They got the shipping cost refunded and full purchase price of the product. So they saved the restocking fee and the shipping charge. This worked out well. But only because they took pictures and emailed those pictures before it arrived with us so we could compare and it was pretty obvious to say to UPS “this is not what you picked up“. The claim is the responsibility of the shipper, so make life easy on yourself and take some pictures! Please take pictures of the product securely packed. Email us those pictures as soon as it is picked up referencing your RA#. Then we will be in touch once we receive it our end. Truck making a delivery using a lift-gate. 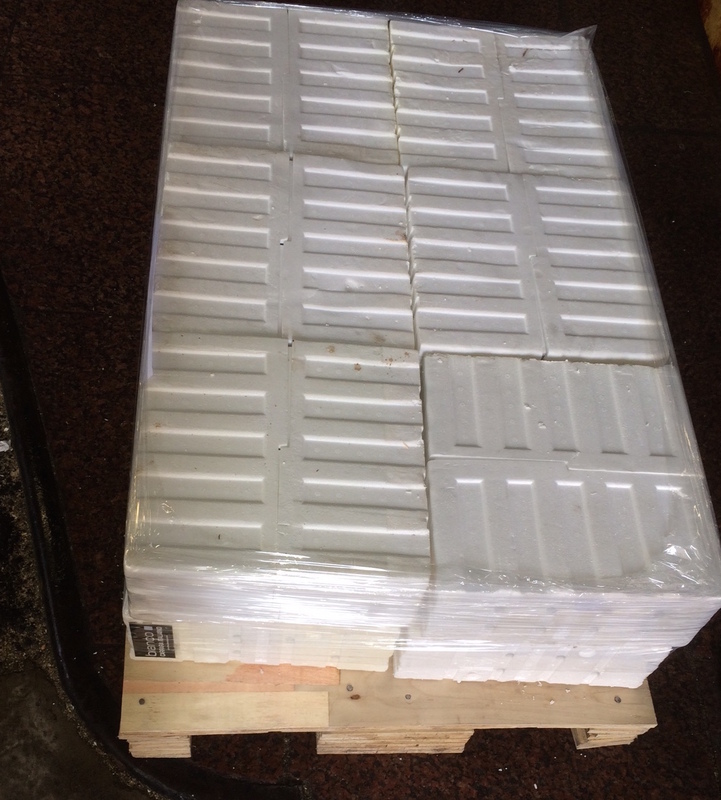 Orders over 50SF or field tiles that cannot ship UPS ground due to the risk of breakage (the crate/pallet supports the stone tiles) ship what is called Motor-Freight (commonly called freight), another term thrown around is LTL (means Less than Truck Load), which just means you are shipping less than a full-truck load a full truck is about 10,000SF. This post is to help customers that are receiving a LTL delivery. #1. You know your area. Please if you have long/narrow roads, wooden bridges that cannot take certain weights, or if it is very difficult for large vehicles to get down your street (aka weight restrictions). UPS freight will stop at the point it can only go as far as. The UPS driver will not risk the vehicle and his career driving a potentially 30,000Lbs vehicle over a ‘light load’ bridge. If this is your home please let us know this ahead of time, so that the products that you have ordered can be delivered to your home without and breakage or any difficulties with the delivery process. 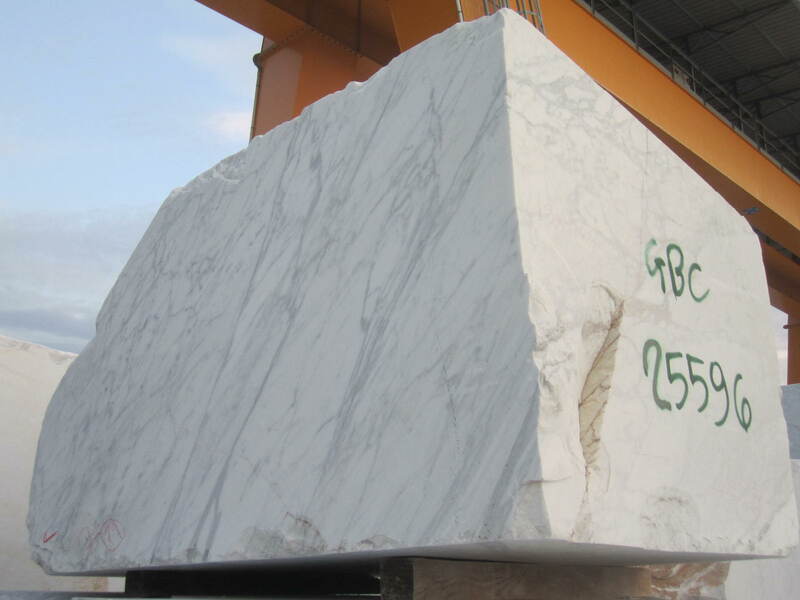 Marble is not a TV or appliance it can quickly weigh 2,000Lbs in a crate. #2. Our shipping terms are curbside delivery. This means the driver will not “officially” go on your property (for cash they often do, there is a gratuity system in this business. Like others when you take a service beyond its agreed terms). Marble is known to be one of the heavier products that we have to transfer at our company; and therefore we cannot transport it from the curbside to other parts of your home. Please be prepared that when we deliver the marble to your home, it is your responsibility to transfer the marble from the truck to your garage, or wherever you might want to store the marble. This is a very important component to the delivery process, so please keep this in mind. 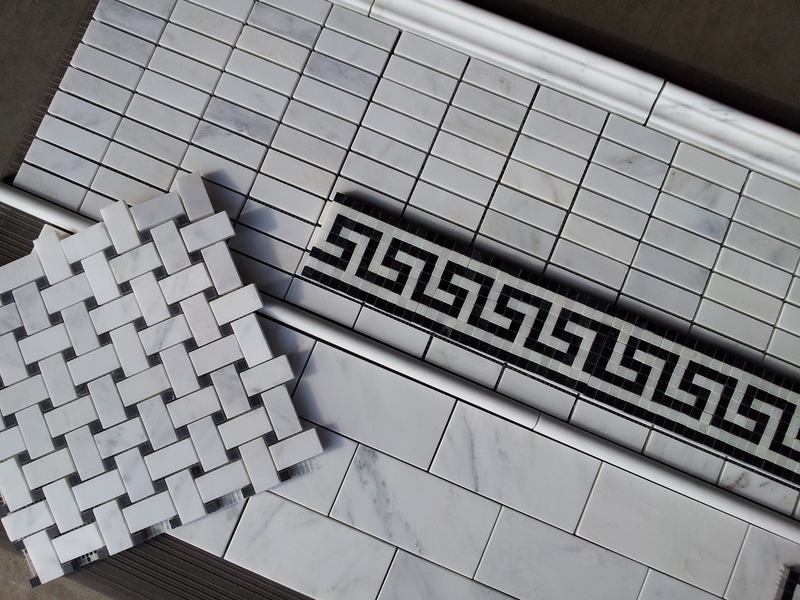 You placed an order online for example 150 square feet of tiles, mosaics and trims. You are sent an email confirmation (this is our primary method of communication so please leave an email. Gmail accounts divert all emails to spam, so when you are sent the confirmation you will not personally receive the message yourself on your inbox, or receive the tracking details for your shipment. Our goal is for this not to happen to you- we all have one of those, gmail, yahoo, etc accounts; however, this is a $2,000+ order so use a good email account. Then in 24-48 hours your order ships from our warehouse. 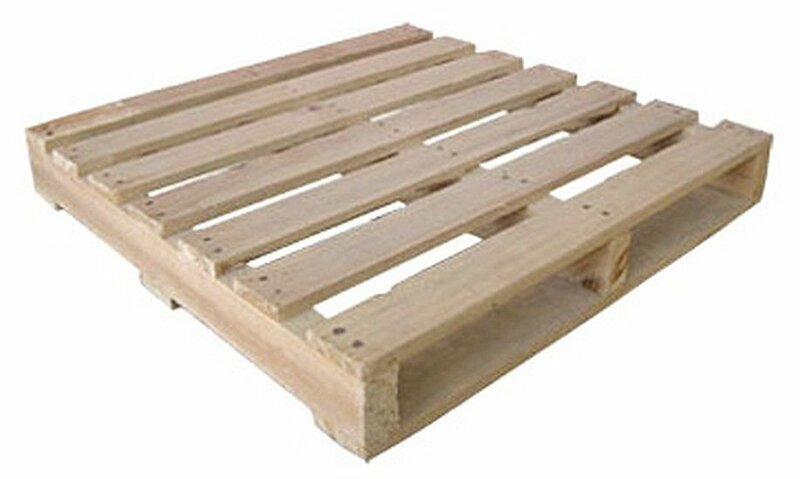 It will ship on a pallet or inside a wooden crate. 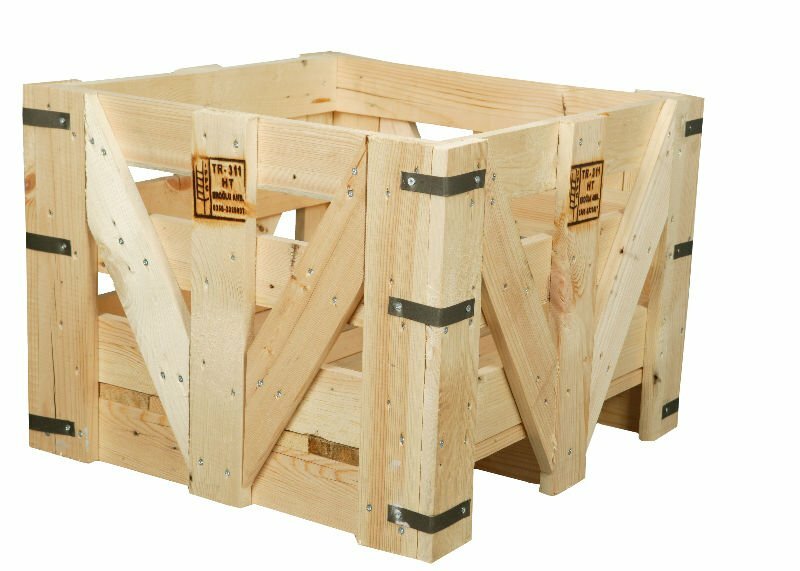 (The closer to 300SF the more likely it is to be inside a wooden crate). We then email you the tracking number and website of where to tracking your shipment. The tracking number is called a PRO#. You enter the PRO# into the “enter your PRO#” into the space on the home page and it provides you a detail of your order and it’s progress. We provide you the tracking number around 3-4pm. It takes about 10 hours for the freight companies to upload the number into their website, so it is best to check the following morning. THE TRACKING NUMBER IS IMPORTANT on that website tracking page is the shippers 800 number, you can call them, follow up with your order, ask questions. You are the consignee in technical speak, so they will only communicate with you in regard to delivery times and your shipment. Your order ships from our warehouse to the freight companies main distribution center in your delivery area. The Distribution center calls you. As of now, they have your order nearby and are ready to load your shipment onto a smaller truck for it to be delivered to you. The distribution center needs to ensure you are home and able to sign for it when they deliver the marble to your home. SO PLEASE leave a number that you will easily pick up at any hour when we need to contact you. If we are not able to reach you, the delivery process gets set back and it becomes a more complicated and time-consuming process on both ends. (I know no one likes to give out their phone number or good email address, but please do-confidentiality is extremely important to us, and we will make sure not to share your personal contact information with anyone outside our company). The delivery time will be a WINDOW (not an exact time) and that window can be quite large. You can get a better idea of the time by calling the local terminal and asking them for a better ETA on the day. Once the appointment time is made between you and the shipping company, then your order is loaded onto a 30′-50′ truck or a Box truck with a power lift-gate. 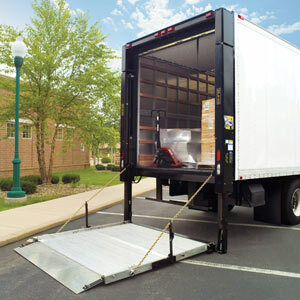 Order is lowered down to your curbside using power lift-gate – kind of like an elevator on the back of the truck that unloads your order easily and safely. It is a curbside delivery. Curbside delivery is a specific freight term. It means he will not go on your property. The shipper is not insured to go on your property. And if you think about it, would you want them? If they get hurt, you could be held liable for the damages (home-owners insurance). If you are in NYC this can be a particular issue. Please consider having the contractor on hand to receive the tile. I am sure you do not want your shipment outside on the street in NYC any longer than it has to be. So please co-ordinate this. At this point comes signing for the delivery. The wooden crate is secure, the crate would have to be smashed in for it to have damaged the tile. On a pallet shipment the pallets are banded and shrink wrapped. For there to be damage the boxes would be torn and banding broken. If it looks to be in good condition please sign for it. If it is damaged please sign for it also, but note on the paperwork “Shipment Damaged” (there is less than 1% chance of this happening). If you can please take a snap with your cell phone camera of that paperwork with you writing on it “shipment damaged” then email from your phone. A copy is always a good idea and phones make great copiers these days. Then you and your helpers move your order indoors once the pallet is pushed of the metal lift-gate. Will they bring the product into my garage? It is “technically” curbside delivery. But this is America and unofficially there is a gratuity system for freight deliveries. (There is a gratuity system for most services, this is no exception). By that I mean “cash”. This can motivate the driver to do more than his companies official terms. I know even for my own delivery for $20.00 (now I had a easy driveway) they backed the truck up the driveway and then pushed the pallet into my garage. For another $50.00 he would have moved it in doors. It was his last delivery and he had time. But this is clearly down to a) the driver b) your skills and finesse as a negotiator.